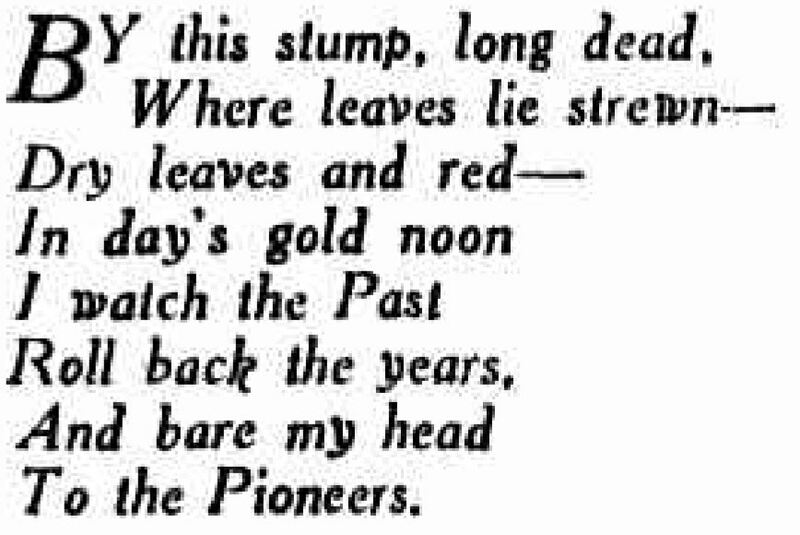 Poor old Explorers' tree. It's in a dreadful state. 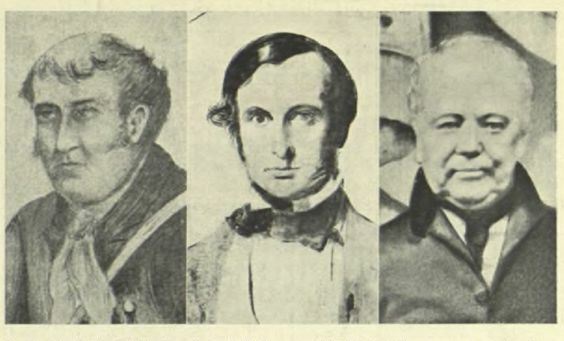 Gregory Blaxland, William Wentworth and William Lawson. In 1813 the three men pictured above set out to cross the Blue Mountains of New South Wales, keeping to the ridges, rather than the deep, forested valleys. Accompanied by five servants, they were the first European settlers to succeed. 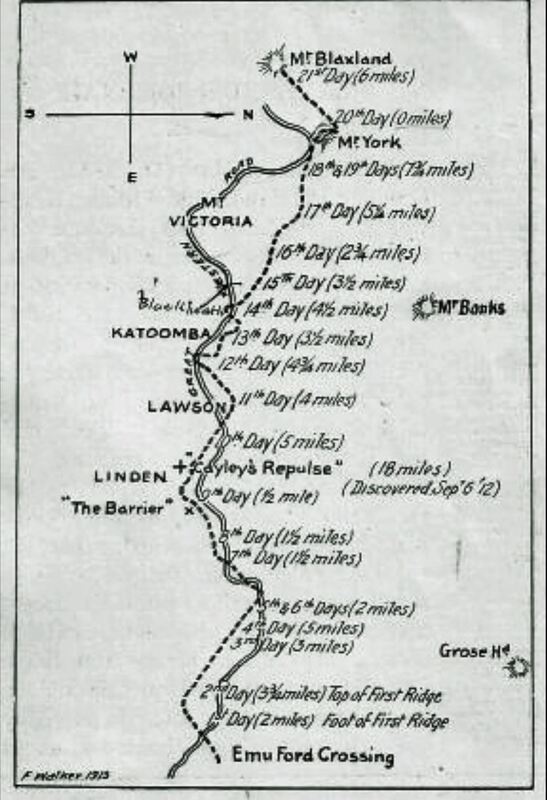 Map of the journey drawn in 1913 by Frank Walker, with the path of the Great Western Road beside it. 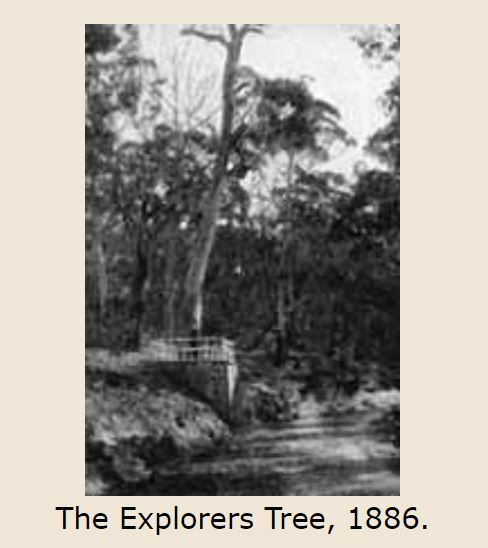 I think we would all agree that the Explorers’ Tree (Eucalyptus oreades ) outside Katoomba is a sad sight. But to be honest, t’was (almost) ever thus. By the 1880s it was dead, and posing a danger to visitors and passers by. It was said that the explorers had carved their initials on the trunk, but if true they had long vanished. The tree standing tall, but already lifeless. 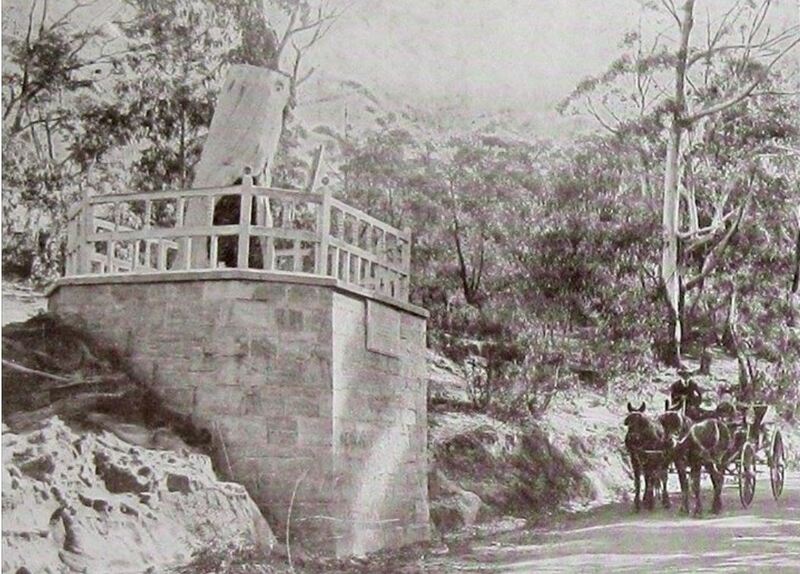 In 1904 the top was chopped off and taken to the newly built Hydro Majestic Hotel. The plan was for it to be fashioned into a relic for guests to admire. 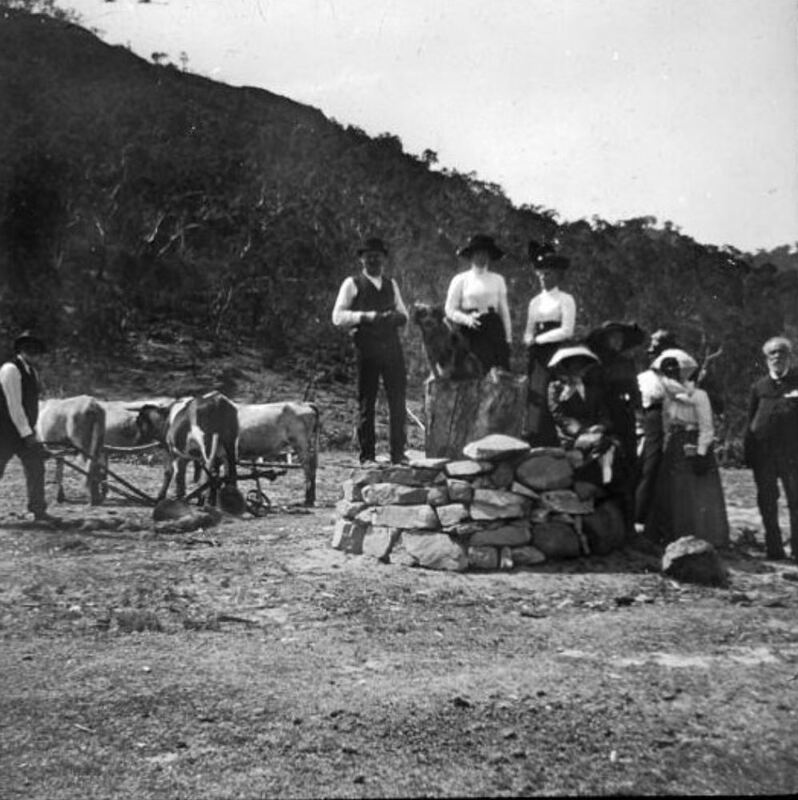 Unfortunately it was destroyed during a bush fire, in 1922. Did Blaxland, Wentworth and Lawson, really carve their initials on the trunk in 1813? It seems unlikely. There is no documented evidence, and the first mention of it did not appear until the 1860s. Some people have suggested it was all a hoax, to lure visitors up the mountains in those early days. We passed in the first mile a much over-rated and doubtful relic – “Wentworth’s Tree”. I have seen a good many better trees. Why the tree next to it is better. The thing isn’t a tree at all; it is an old dead stump, a fraud, not worth the trouble of putting a railing around. There are said still to remain upon it the initials of the three explorers. Three? Wentworth must have had a big party. John Smith, Annie Smith (ladies, too), Henry Jones, William Mulqueeney – and dozens of others. At all events, Wentworth, though he may have been a good explorer, had no knowledge of timber. Graffiti remained a problem down the years. In 1939 a local newspaper reported; It is a matter for regret that ‘visitors’ have found means of hacking their initials on the coping of this monument. Left alone in Westminster Abbey, such fiends would not hesitate about scratching their worthless names on the tomb of the Unknown Warrior. The Mayor – The glass case would not last a week up there! Alderman Collins – And half eaten by white ants. The Mayor – It has been suggested that it should be cut down and removed to the Town Hall. Alderman Collins – But it’s loaded with white ants. Alderman Hendry – Why not remove it to the Town Hall and substitute a model at the present site? Alderman Collins – I move that we advise the Town Planning Association of the condition of the tree and suggest that it should erect a monument to mark the spot. At some point the rotted core was filled with concrete and steel bands were placed to hold the increasingly flimsy shell together. A car crashed into the surrounding wall of the stump in 2012 and since then it has become a bit of an eyesore. In the end it doesn’t really matter whether the explorers carved their initials on the tree or not. It still stands as a memorial to their great achievement. Perhaps what’s left needs to be incorporated within another monument. I understand the Blue Mountains Council applied for and received a $100,000 grant from the State Government to do something, so we can only hope. There is another complication in all this. 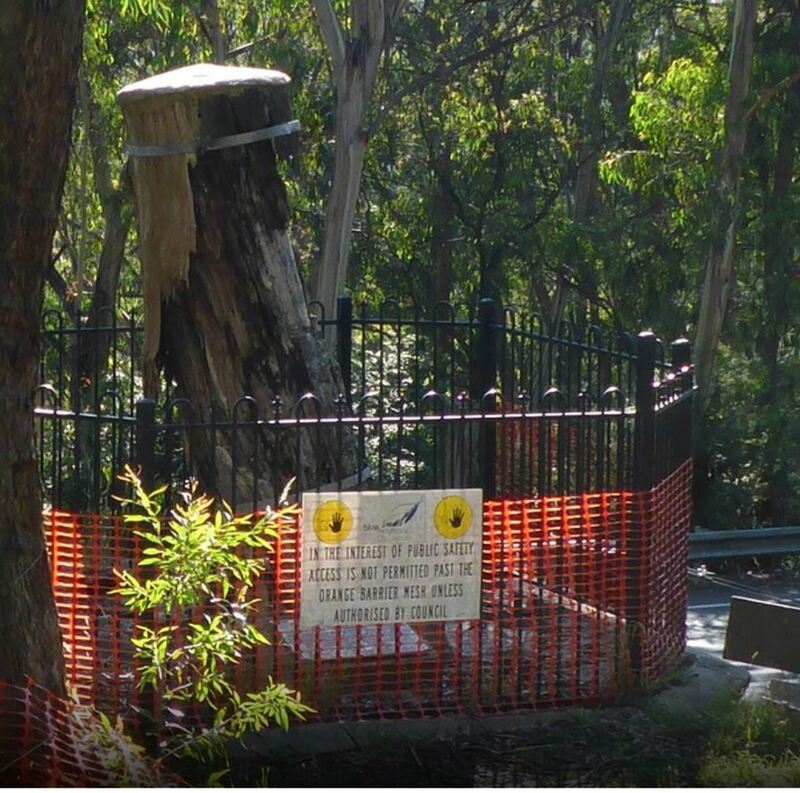 If there is to be a replacement monument, should it remain at the Katoomba site, or be placed where the 1813 expedition ended? 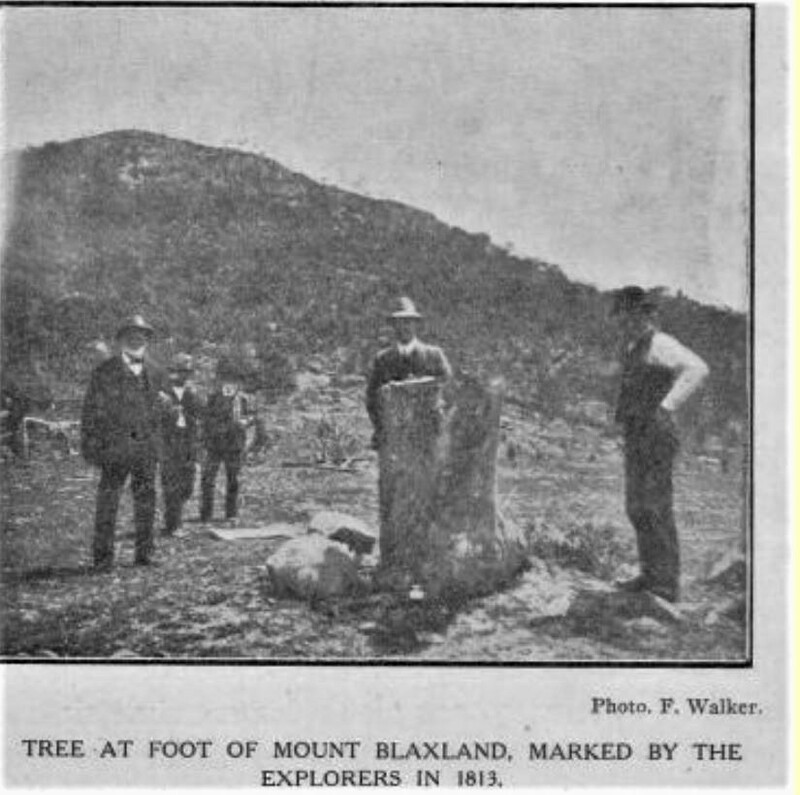 Oddly enough there were claims of another marked tree at Mount Blaxland, and photos as well. UPDATE – The Blue Mountains Council responded to this story. The government grant was awarded in August 2018. Council are currently formulating plans for an upgrade of the whole site. Excellent. You do such a good job, Chris.